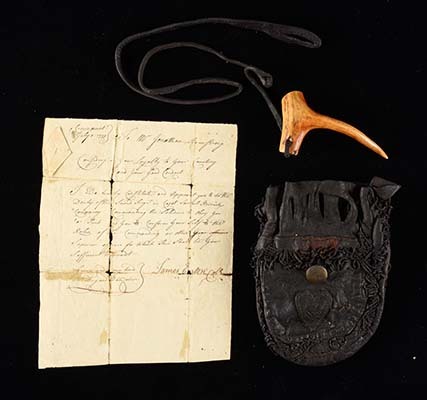 Roger’s Rangers 1757 Commission and Two Powder Horns of Ranger Charles Bulkeley, Purchased Directly From His Descendants. Large Engraved New York Map Powder Horn Attributed to the Pointed Tree Carver Horn, List of Distances From Ft. George to Other Forts. AR Engraved 14th Regiment Fort Pitt, Fort Ligonier and Fort Beford Powder Horn Attributed to John Small. Engraved Map Powder Horn of Alexander Sutherland, Capt. in the J.H.B. Attributed to The Master Carver. Powder Horn of Christopher Flanders Made at Crown Point, Dated 1760. John Fox Engraved Forbes Road Map Powder Horn of John Cox, Dated 1764, Fort Pitt. Signed Jacob Gay Powder Horn of John McKeen, Dated 1759, ex. Guthman, DuPont Collections. Rare Engraved North Carolina Map Powder Horn With View of Charlestown, SC and Fort Johnston, Owned by Captain Chas. Richardes. Engraved Powder Horn of Elijah Sharp, Dated 1759, Fort Edward, "Defiance to the Proud French". Master Carver Attributed Engraved Powder Horn of Thomas Hooton, Dated 1763, ex. DuMont. Engraved Fort William Augustus Powder Horn Dated 1763, George Rick's Light Infantry. 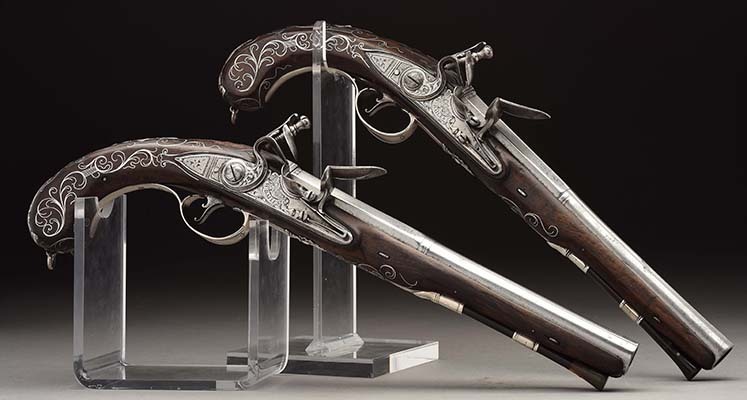 Archibald Montgomerie's Pair of Fine English Silver Mounted Flintlock Pistols with Belt hooks, by Bailes, 1760. Documented Pair of Silver Mounted Pistols by Barbar with Shoulder Stock, Belonging to Captain Robert Ormes, aid-de-camp to Gen. Braddock. Important Identified Scottish Flintlock Pistol by Allen & Basket Hilted Backsword, Both Used by Ensign James Grant of the 77th Highlanders. General "Mad" Anthony Wayne's Documented Silver-Mounted Flintlock Pistols by Wilson, Given to him by Captain Patrick Carr. Extremely Rare Brass Revolutionary War Continental "USA" Button Mold. George Washington's Table of the Ohio River From Fort Pitt Circa 1770. RANGER ISRAEL PUTNAM'S REPORT OF HIS 1755 SCOUTING EXPEDITION TO TICONDEROGA. Francis Pfister's Folding Map From of the Hudon River Corridor, Complete with Map Case, Circa 1758. PFISTER'S 1760 COMMISSION AS LIEUTENANT IN THE 60TH OR 'ROYAL AMERICAN' REGIMENT. 1769 CONTRACT RENEWAL TO OPERATE THE NIAGARA CARRYING PLACE FOR THE CROWN. Documented 1803 Dated John Brady Lehigh Percussion Kentucky Rifle with Indian Sideplate and Map Patchbox. Rare Documented Ferguson Breech Loading Flintlock Pattern Rifle No. 2 by Durs Egg. Documented Gary Cooper's Original German Swivel Breech Jaeger Used in "Unconquered". Fine French Fusil de Chasse with Bead Decoration, Dated 1759. Fess Parker's Iconic Golden Age Carved and John Fondersmith Signed Flintlock Kentucky Rifle.